Bradley Lethbridge’s Pompey debut shows how hard he’s working. That is the verdict of academy boss Mark Kelly, after the 18-year-old was handed his Blues bow on Tuesday night. Lethbridge made his maiden appearance for Kenny Jackett’s side in their 3-2 Checkatrade Trophy victory over Tottenham Hotspur under-21s. The second-year scholar spearheaded Pompey’s attack for 65 minutes before being substituted for Oli Hawkins. Lethbridge has been in superb form on loan at Bognor this season, scoring nine goals in 17 appearances. 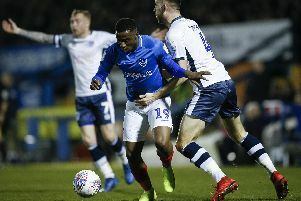 Kelly took plenty of encouragement from the forward’s first Pompey appearance. And the academy chief feels Lethbridge has reaped the rewards of his Nyewood Loan spell. Kelly said: ‘We’ve looked at Bradley and his loan spell at Bognor has done him the world of good. ‘He’s played senior football over there, scored a load of goals and is in a good place. ‘He’s getting that physicality about him, chasing people down and scoring goals. ‘I was pleased for him because he's worked hard for the past three or fours months. It’s just another staking claim in how hard he is working. ‘In the first half, we didn’t press quick enough but when we did it helped Bradley because it backed him up a little bit more. ‘He certainly showed his physicality at times – when he challenged the goalkeeper he put him on his backside. ‘That’s what Bradley is all about. He linked the play quite well at times and it was a steady little workout for him on a night where Tottenham wanted to play across the back four. ‘He had a lot of hard work to do and did it willingly – that’s part of the process we're looking at and it was a big tick in the box for him. ‘Bradley also got a few people in and when he did get the ball in the box he tried to play one or two people in instead of maybe hitting it. Lethbridge is set to return to Bognor on loan, along with first-year professional Dan Smith – who was an unused substitute against Spurs. Kelly reckons playing regular senior football is significantly helping the pair’s development. He added: ‘We’ll keep him over at Bognor. He’ll go back in and it’s doing him the world of good over there. ‘He’s been obviously working with Dan Smith over there as well, while a few of the second-year scholars have went in and out.